IIC slave interface and HDMI DDC interface are available for configuration and firmware update. 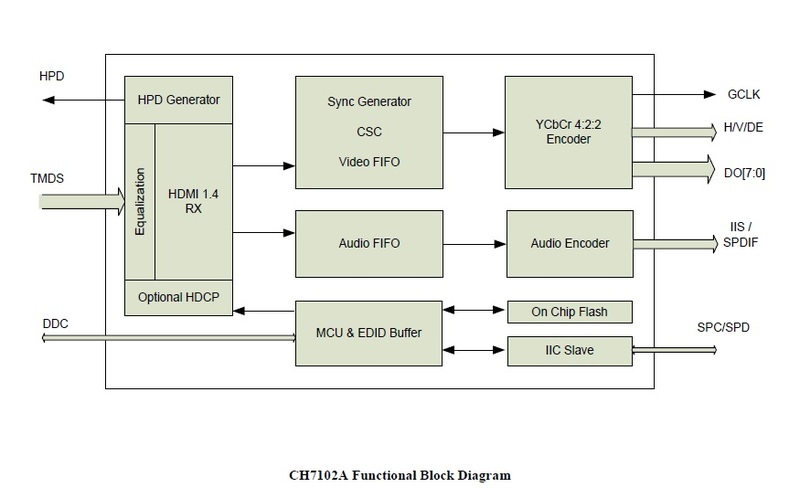 Chrontel’s CH7102A is a low-cost, low-power semiconductor device that consists of HDMI receiver, YCbCr 4:2:2 encoder and audio encoder, which can convert HDMI signals into 8 bit YCbCr 4:2:2 outputs with IIS or SPDIF audio output. The HDMI Receiver integrated is compliant with HDMI 1.4b. With sophisticated MCU and the On-chip Flash, CH7102A supports auto-boot and programmable EDID ROM. Leveraging the firmware auto loaded from the embedded Flash, CH7102A can support HDMI input detection enter into Power saving mode automatically.